We finally dive into Casca's mind and see the calficied damage of the Eclipse. Stick around until the end for about 20 minutes of us gushing over Zelda: BotW. PS: I finally did it. I said the wrong number podcast at the start. When you hear "Episode 86," just know that you aren't suddenly a visitor from the future, I merely said the wrong number. I think it can be done. 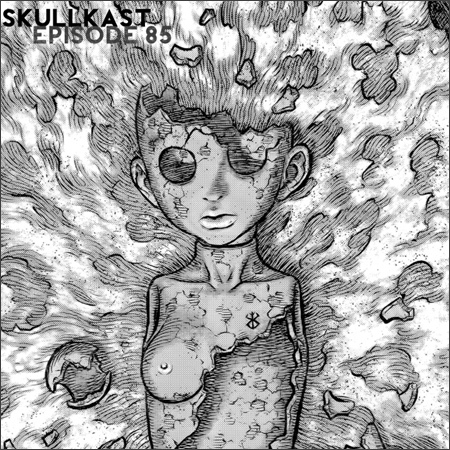 Fortunately, there is a full one-second pause between the opening line "Hey guys, and welcome back to Skull Kast for episode 86" and the "I feel like we should've hit a 100 by now..." You can use this pause as an advantage. If you cut out that opening line and re-record it as "Hey guys, and welcome back to Skull Kast for episode 85", that one-second pause will allow you to smoothly switch out the incorrect opening line with the corrected one without any noticeable effect on podcast's sound. It's as if that brief pause can serve as a sonic "buffer zone" between the corrected opening line and the rest of the podcast. How can I say this nicely... I don't care enough to edit it? I think we'll all be okay if it just stays the way it is. I only mentioned the mistake in the thread as a self-effacing joke. If I actually cared that much about the .5 second flub, I'd have re-edited the show, re-exported, re-tagged, and re-uploaded it last night before I hit post. Fun listening, as always. Thanks, y'all! As you mentioned we had a preview of this episode, so weren't in completely uncharted territory going into it. I kind of appreciated the preview because it gave me something to get me by until the manga resumed. I also thought it was neat to have the rough sketches and be able to compare them to the finished version. The "spiky mountain" looks much spikier in the preview, which I thought was kind of interesting. With the next episode being mostly unspoiled, except for possibly a few snippets of scenes, I'm really anticipating seeing what's to come. The "spiky mountain" looks much spikier in the preview, which I thought was kind of interesting. Yeah, good call! Casca also looked more like a marionette in the preview, whereas in the finished version she looks more like a clay doll, so some design changes were made, as one would expect. As we said on the show, all sketches from the guidebook except those with Guts at the banquet were included in 348. You just have to sort of squint at a few of the sketches of the fragment to see how they were incorporated into the episode. Great podcast you guys! That small little tangent you guys went on about how Guts might react if he were allowed to be present with Farnese and Schierke had me going. How he would kill the Guts dog,(this is funny beyond all measure for some reason) and him ripping the coffin open and shaking the Casca doll "Ge-Get-GET BACK!" I could almost see Miura pulling off some pretty dark humor in a scenario like that. Like I think it was Griff or Walter that mentioned that she would evaporate into dust, but I think it would be funny if her head just fell off and rolled away and Guts freaks and goes chasing after it. LMAO! I was on my commute to class listening to the podcast and I laughed out loud at that part. Like I can honestly see Guts and Guts dog having a knee-jerk reaction to each other and going at it. Farnese and Schierke would be like: Also it would be interesting to see how Guts would take it if he saw that Casca's inner perception of him is that of a dog. In all seriousness though an interesting point was brought up that i have always wondered, that is there a possibility that some aspect of her "self" would be just gone or damaged. Like that of her warrior spirit. I think that this is something to be considered because Guts fell in love with the warrior that Casca was. And Casca gives all credit for who she was able to become to Griffith. It is a strange thing to consider that the aspect of Casca's old persona her warrior side was created by Griffith--or at least I think that is how Casca is going to feel about it. Maybe that aspect of herself just won't be able to be put back into her. I think it could create some very interesting character drama for both Guts and Casca that even with her healed and lucid she is not the tough warrior woman she once was, and if that would affect how he feels. I've always thought it was a given that Casca would return as the Amazon she used to be but Miura has subverted my exceptions in so many awe-inspiring ways, do you think it would be a possibility that he might have Casca evolve into something other than a warrior post healing? Personally I want warrior Casca back (even though it would take time) but if Miura had something else in mind for her I would be intrigued on where he could take her. Or maybe Casca reclaiming her warrior spirit independent of Griffith would be her character arc that she would have to do on her own and not something Farnese and Schierke can just back into her. I persoanlly found Casca kinda down on her self in Gold Age arc (she didn't give herself enough credit for her accomplishments). And Casca gives all credit for who she was able to become to Griffith. It is a strange thing to consider that the aspect of Casca's old persona her warrior side was created by Griffith--or at least I think that is how Casca is going to feel about it. Clearly she became a warrior because of her encounter with Griffith but I don't believe she credits that entire aspect of her life and personality solely to him. That'd be kind of odd, in fact. However she may not feel like fighting anymore when she comes back, for reasons other than her mind being damaged. Maybe she'll just lack the sense of purpose or the will to do it, which would be understandable. I persoanlly found Casca kinda down on her self in Gold Age arc (she didn't give herself enough credit for her accomplishments). The Golden Age arc, you mean. And Casca's modesty and self-doubt were key aspects of her character.